LUX RADIO THEATER'S TWO HOSTS, CECIL B DeMILLE WITH JOAN CRAWFORD AND WILLIAM KEIGHLEY WITH ANN BLYTHE. As reported several times in Network Radio Ratings, 1932-1953, Monday was the night when CBS monopolized the ratings and NBC cried all the way to the bank. Leading the CBS dominance was the evening’s longtime Number One program as illustrated by its two longtime hosts pictured above, Cecil B. DeMille, (with Joan Crawford), and William Keighley, (with Ann Blythe). That’s enough of a clue for now as we challenge you to pick Monday’s All Time Top Ten programs and/or personalities in order of their popularity. For the most part, Blue/ABC and Mutual were simply onlookers in the Monday competition except in the area of Multiple Run programs - Monday through Friday strip shows, in particular. Multiple Runs have been excluded from this exercise which focuses on weekly programs. Discounting the ten Multiple Runs, 18 programs and personalities registered at least three seasons in Monday’s Top Ten over the 21 years of the Golden Age. Listed below are all 18 in alphabetical order. Here’s your challenge: Create a list of Monday’s All Time Top Ten in order of their popularity. To help with your list we’ve added the total number of Top Ten seasons that each of these attractions scored on Monday night during the Golden Age. It’s not easy to rank Monday’s All Time Top Ten in order because once past the top four it becomes one of the most difficult nights. 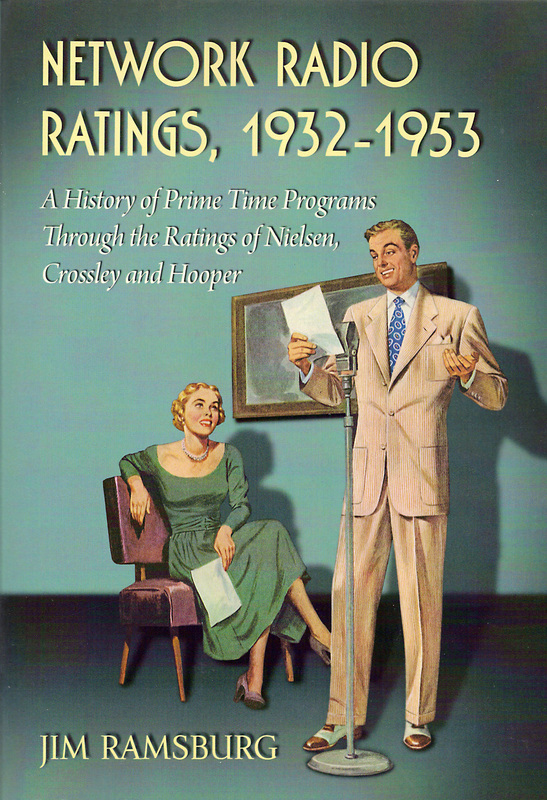 So here’s another clue: Eight of Monday’s All Time Top Ten were CBS attractions in their peak seasons. .
Look below the book cover and you'll see how the millions of Network Radio listeners ranked them. 4/ Bob Hawk’s comedy quiz shows also registered winning seasons on the CBS Monday schedule. His glib delivery and fast paced audience participation programs enjoyed eight seasons in the night’s Top Ten - once in third place, three in fourth, three in fifth and once in seventh for a total of 51 points. 5/ The Voice of Firestone was a testament to longevity. It was a fixture on the NBC Monday schedule at 8:30 for all 21 years of the Golden Age. (It actually began on NBC four years before the era in 1928 and remained on NBC and ABC another four after it ended.) During the Golden Age, Firestone Tire & Rubber’s showcase of classical music registered ten seasons among Monday’s Top Ten programs for a total of 38 points. 7 (tie)/ The Sinclair (Wiener) Minstrels, (so nicknamed for their originating station, WENR/Chicago), is the only Blue Network program on the list. The Gene Arnold hosted show finished in second place for three consecutive seasons, 1932 to 1935, for a total of 27 points. Then along came Lux Radio Theater on CBS at 9:00 opposite the show, and like their sponsor Sinclair gasoline, the Sinclair Minstrels’ ratings went into the tank. 7 (tie)/ Vox Pop was a 13 year fixture on Network Radio featuring audience participation interviews of a human interest nature conducted by Parks Johnson with co-hosts Jerry Belcher, Wally Butterworth and Warren Hull. The show was slotted at 8:00 over its five seasons on the CBS Monday schedule and scored 27 total points. 10/ Pick (Malone) & Pat (Padgett) were two Irishmen whose blackface act made Amos & Andy sound brilliant in comparison. Known as Molasses ’n’ January on Maxwell House Showboat, Pick & Pat headlined their own half hour minstrel shows for US Tobacco’s Dill’s Best and Model pipe tobaccos beginning in 1933 on NBC. Their 1935 to 1940 run on CBS at 8:30, leading in to Lux Radio Theater, resulted in five Top Ten seasons and 25 points. The rest of the candidates for Monday’s All Time Top Ten were: Guy Lombardo’s orchestra - 23 points; The Gay 90’s Revue - 19 points; The Railroad Hour - 17 points; Dr. IQ - 13 points; The Cavalcade of America - 9 points; Information Please - 8 points; Wayne King’s orchestra - 8 points, and Carnation Contented Hour - 7 points.